Doug's South Lake Tahoe Vacation Cabin - ~HDTV~ and Wi-Fi! 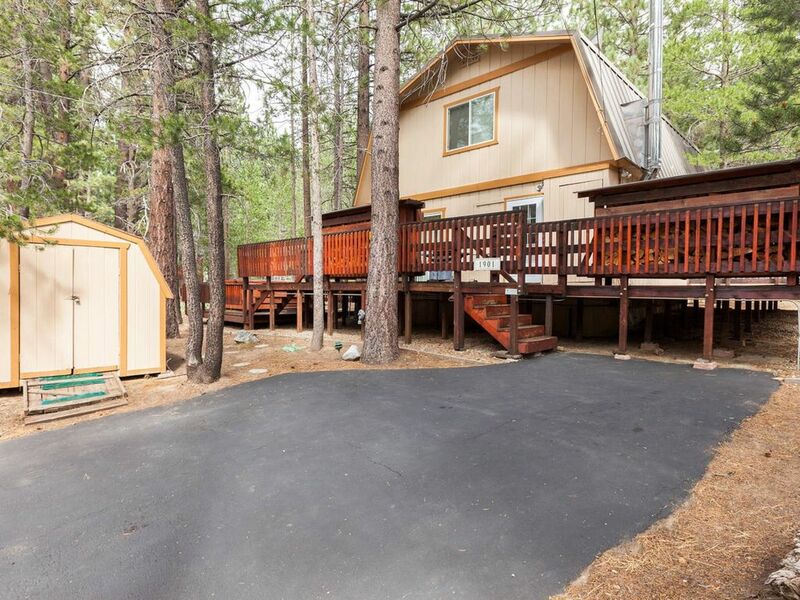 This beautiful South Lake Tahoe vacation home is located just 5 minutes from town, yet is located on a quiet cul de sac with a rural, woodsy atmosphere. You can gaze at the stars in the 8 person hot springs hot tub on the private deck. This is a true vacation home - perfect for all seasons. It comfortably sleeps 10 adults and is minutes from the Lake, Casinos, Heavenly, Sierra at Tahoe and Kirkwood. During the summer months have fun fishing, mountain biking, river rafting, horseback riding or just plain relaxing. World famous Lake Tahoe is just minutes away. Be sure and check our WEB PAGE LINKS BELOW for current availability as well as more pictures, our price guarantee and rental info including our own FAQ. From our Home Page we also have a Lake Tahoe Information page that provides access to road conditions, weather, ski reports and Live Camera shots for Lake Tahoe. I've always enjoyed getting away from the bay area and visiting Lake Tahoe. When I was in college in southern california I used to make annual trips to Lake Tahoe with my friends. Now years later I have my own place to call a second home in Lake Tahoe. During the winter I volunteer as a National Ski Patroller helping people who are hurt on the hill at Sierra @ Tahoe. In the summer I enjoy bike rides through the forest right at the end of our street! It's amazing how many trails are available! Originally I wanted to have my own property to use for skiing exclusively, but then I found out that there's even more to do at the lake in summer than in winter! Our property is in a nice neighborhood which is outside the hustle and bustle of South Lake Tahoe. Yet we're close enough to town so that trips in for dinner and activities are easily done. Being on a cul-de-sac has it's advantages as I never have to worry about the kids playing outside as we have virtually no traffic on our street! Parking for up to 4 cars in the driveway, ample parking on the street, but only when snow removal conditions do not exist. We have a wood burning stove, but unfortunately cannot supply wood for it due to logistical challenges. Only available during Summer months! Free long distance domestic service within the continental US. We don't really have facilities for wheelchair access due to the stairs leading up to the deck and then the 2nd floor stairs inside. Hotsprings Grande Hot Tub accommodates 8 people easily! Just be sure to shower before you use the spa!